Butler’s men’s basketball team huddles up during a game. The Bulldogs will face Nebraska in the first round of the NIT. Jimmy Lafakis/Collegian file photo. The Butler men’s basketball team has accepted an invite to the National Invitation Tournament. The Bulldogs enter as a No. 5 seed and play at Nebraska in the first round on March 20 at 9 p.m. on ESPN2. 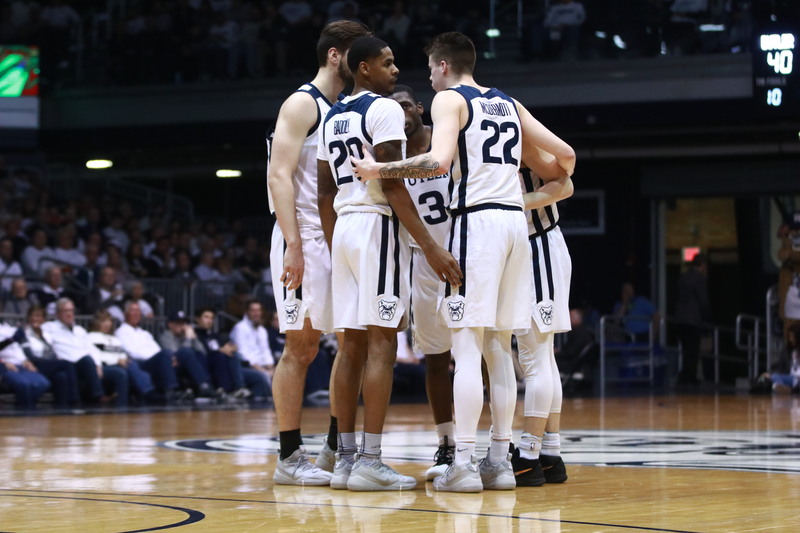 It will be the Bulldogs’ first appearance in the tournament since the 2005-2006 season and the first time in five seasons Butler did not participate in the NCAA Tournament. Butler athletic director Barry Collier is a member of the NIT selection committee. Butler finished the regular season 16-16 overall and 7-11 in Big East play. #Butler is a No. 5 seed in the NIT and will play at Nebraska. Michael Lewis is a former #iubb player and Butler assistant coach who is a Nebraska assistant. Game is on Wednesday. If Butler advances, it will face the winner of TCU and Sam Houston State in the second round.